We have been continuing to study the Linux job market’s skills in demand. With the latest update to the IT Skills Watch, we have gained some new insights into the IT skills that are currently required by employers of Linux talent. In the last quarter, the most prominent change was noticed in the demand for Hadoop and database specialists. Another interesting observation is the further increase of the demand for Python programming language. Additionally, the recent IT Skills Watch indicates the continuously rising demand for DevOps Engineers. The increasing popularity of Apache Hadoop is becoming reflected by our statistics. In the last quarter Hadoop jumped from position 11 to position 5 in the Top 40 IT Skills table. Such jump was observed due to 58.53% increase of demand for Hadoop. The graph below depicts the IT Skills Watch ranking of Hadoop over the last five quarters. 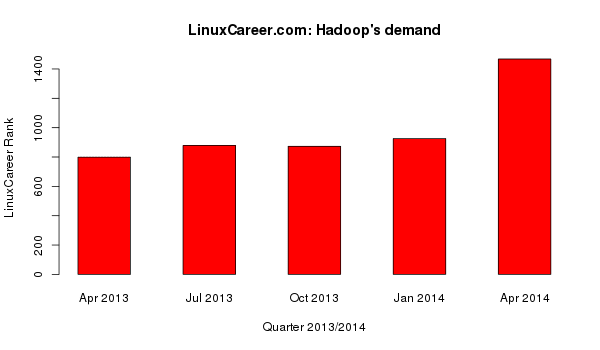 The last quarter’s increase is the first such high rise, which may suggest a high demand for Hadoop specialists in 2014. 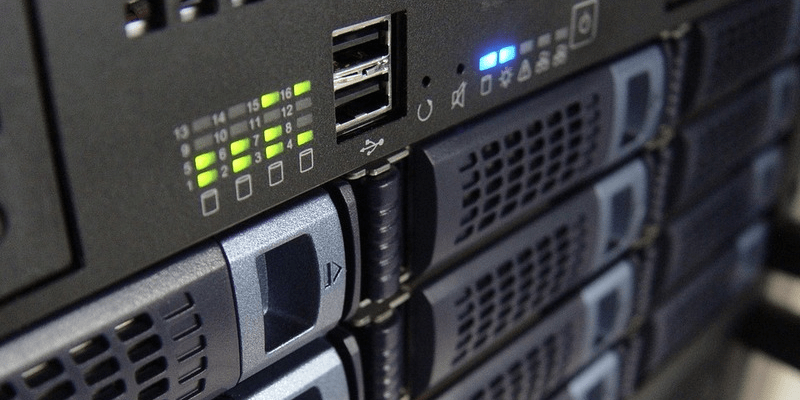 Since Hadoop is highly correlated with demand for knowledge of databases (see also IT Skill Sets), the high increase in demand for databases such as noSQL (40%) and mongoDB (10%) was also reported by the April’s IT Skills Watch. In the article Choosing a programming language: Python vs Perl we have realized that the demand for Python might become greater than the demand for Perl. In that article we looked at April 2013, Jul 2013, Oct 2013 and Jan 2014 results of the IT Skills Watch. In particular, the respective rankings of Python and Perl. Perl was always higher in the rankings than Python. However, the difference in demand for these two programming languages was becoming less and less pronounced with time. In fact, the results suggested that Python would soon overtake Perl in the rankings. Now we can verify this conjecture. In April 2014 IT Skills Watch, Python ranks in the third position just below Java and C/C++/C#. Perl, on the other hand, drops to the fifth position in the top 20 development skills table. We can further support Python’s popularity with an increased interest in “Django”, the Python based development framework, which now for a first time, popped up in the top 20 development skills table. The prognosis for Python experts seem quite optimistic for 2014. Another group of skills for which the demand was increasing in the latest months is DevOps, Chef and Puppet. We have already noticed in the article Jan 2014 IT Skills Watch report: three IT skills on the rise that DevOps is one of the rising skills in demand in the top 20 development skills table. In the latest update DevOps’s demand increased once again by 18.39%. Similar increases were recorded in Jul 2013, Oct 2013 and Jan 2014 of 18.80%, 22.16%, 17.20%, respectively. Such increases were accompanied with the need for Chef and Puppet skills.